The flexibility and profiling power of the CAL 9500P temperature controller has provided an exceptionally powerful solution for Active Magnetic Inspection Inc. (AMI), a US company that treats and inspects fasteners for the aerospace industry. AMI performs plating, stripping, stress relief and magnetic particle inspection processes for fastener manufacturers. In the aerospace industry, which is highly regulated due to the extreme need for safety, manufacturing precision is key and a business such as AMI depends on meeting quality control requirements. In order to achieve this, a precise level of process control and accurate record-keeping is required. AMI had decided to raise the bar and establish a process system that would earn accreditation from Nadcap (National Aerospace and Defense Contractors Accreditation Program) and thus enable the company to strengthen its position in the aerospace fastener business. To meet this need, AMI’s systems were enhanced by temperature controllers from West Control Solutions. 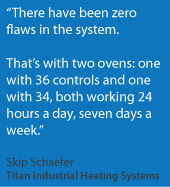 AMI enlisted the services of R.J. “Skip’ Schaefer of Titan Industrial Heating Systems, an expert in the design and construction of temperature-controlled manufacturing processes. Skip’s task was challenging as many points of control were required. These included two stress relief ovens that each required monitoring of 60 product containers. In order to achieve Nadcap accreditation it was also necessary to establish a thorough quality system, including well-documented process instructions and complete records for all production lots including time and temperature data, to meet the needs of the annual audit. The CAL 9500P process controller was chosen as the front end for its flexibility and profiling power. In order to satisfy Nadcap process data requirements, all of the instruments are tied to a central PC that runs CALGrafix. The result is that every point is monitored and stored on a minute-by-minute basis. When the process system was inspected by Nadcap, the results were outstanding and AMI was issued with its certificate, enabling AMI to strengthen its position in the aerospace fastener business.